Received Sand color. Wore on Easter and got huge compliments with buttons down front with a white silky tank underneath with white capris. Very nice and light to wear. Ordered the navy just now. So easy to wear anywhere. 5 stars in medium fit too. Comfort and couture. 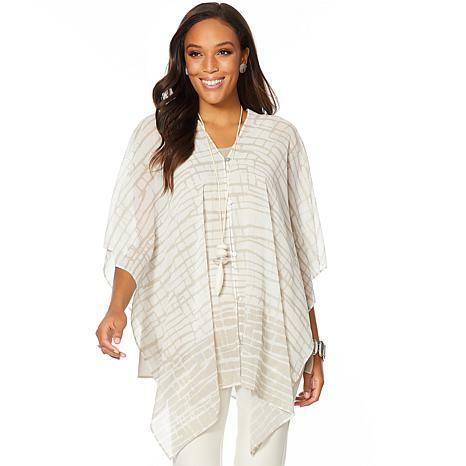 This loose-fitting poncho-style top pairs perfectly with skinny jeans and leggings alike. The elegant chiffon and rich print keep the look fashionable whether you dress it up or down.